For the past several years there has been some item of produce that has stood out for me, that I have not been able to get enough of. One year it was tomatoes. Another year it was melons. Last year it was beets. This year, there didn't seem to be anything that stood out as being particularly spectacular. I suppose it was the crappy growing season, or maybe it was the economy and my budget not letting me run too wild at the green market. I was thinking about it just the other day as I threw yet another butternut squash into my shopping basket. And then realized I had thrown another butternut squash into the cart. And then started counting up, and realized it was the fourth butternut squash I had bought in the past three months (sixth if you count the two I bought in Austin to make roasted butternut squash soup for my family down there). And just like that, I realized that butternut squash has been my vegetable of the season this past season. I have not been able to get enough of it. I've mostly made soups with it, but they have all been different enough that I do not feel like I have been eating the same thing. This squash lives up to its name. It has a rich buttery flavor with a hint of nuttiness that holds up well to other flavors. The flesh is dense and solid, and does not fall apart when sauteed and added to stews and other vegetable dishes. And it purees up into a rich, creamy soup that goes down like smooth velvet. I had gotten in the habit of peeling the squash, cutting it into cubes, and roasting it along with shallots and then making a lovely soup with my stick blender. I was halfway there with the most recent one. I thought I would go for an eastern flavor for this soup, and coated the squash with olive oil, cinnamon, cumin, a little chili powder, and cardamom. I roasted the squash and shallots but did not make the soup right away. In the meantime, I still had about two pounds of red lentils to go through and needed something thick and hearty for work lunches. 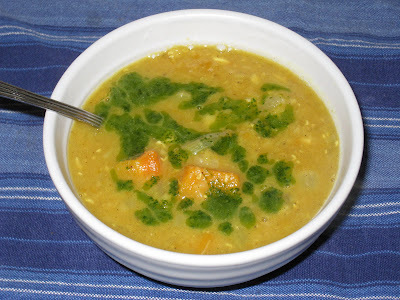 I skimmed through my list of untried recipes and came across something that used both red lentils and butternut squash. As I skimmed over the list of ingredients and instructions, I realized the squash I had already roasted would work for this recipe. I knew the squash already had a strong flavor profile going for it, but I was sure the spices I had used in the roasting would complement the curry and ginger called for in the soup. Instead of adding the squash with the other vegetables and cooking them in the pot, I waited until the rest of the vegetables were tender and added the squash and the shallots at the end, just long enough to heat them through. This soup is truly a party in the mouth. There's the slight hint of sweet sneaking in from the cinnamon and cardamom, with a smart blast of heat thrown out by the curry powder, cumin and chili powder. The sweet heat of the ginger bridged the gap between them. This was the recipe for which I made the cilantro oil I posted about here. The soup was good without it, but with it the flavors sang. For lunch I spooned it over dill rice, which brought out a completely new dimension. I fell head over heels in love with this dish. If you try it, I think you will, too. Preheat oven to 350 deg. F. and line a lidded baking sheet with aluminum foil. Place squash in a bowl and add salt & pepper and the cumin, cinnamon, cardamom, chili powder, and a dash of cayenne. Add a tablespoon of oil and mix everything together. Heat oil and ghee over medium heat in a large saucepan. Add the onion, carrot, celery, garlic, ginger and salt and cook, stirring occasionally, until the vegetables are soft and the onions have begun to turn brown, around 15 to 20 minutes. cover, and simmer for about 40 minutes, until lentils are tender. Stir in the lemon juice and add salt and pepper to taste. Remove from the heat. Serve over dill rice. Drizzle with cilantro oil before serving.